The first movie Viraj Bhatt acted in was ‘Lagal Raha E Rajaji’. 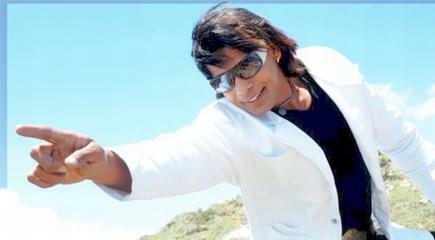 Before that, he was well known actor in Nepali movie industry but, unknown in Bhojpuri films. The movie produced by Kumari Mai Movies, featured Dinesh Lal Yadav ‘Nirhuwa’ in leading role. Other actors include Biraj Bhatt, Rani chattarjee, Manoj Tiger, Sweeti Chabad, Abdhesh Mishra, Gopal Roy, Jassi Singh, Radha Tripathi etc. The story, script and dialogue were written jointly by Ramesh Mishra and Pt. Ram Sewak Mishra. The choreographer of the movie was Kanu Mukharjee, action of Yogendra Shrestha and Gabbar Singh. Music composer of the movie was Ashok Kumar Deep, produced by Ramakant Prasad and directed by Rajkumar R. Pandey.